Collaboration is such as sweet word. Remember, collaborative design, collaborative PDM, collaborative PLM, collaborative engineering, etc. Nice buzzwords, but what does it really mean? For many people, the word “collaboration” is really confusing. Last month I raised the question – Is there a need for real-time collaboration between engineers? The comments and discussion around this topic made me think how to clarify the meaning of real time collaboration. Collaboration is tightly connected to data management. Historically, desktop CAD systems had limited ability to collaborate. It used file management systems to store data. Therefore, the collaboration was hard. Most of CAD tools took an exclusive right on read and write to the file. Engineers tried to put files on shared drives. To control data access was problematic and collaboration capabilities were limited. PDM tools solved some problems related to collaboration. It created a control mechanism to access files. It allow to engineers not to afraid to make changes. It created a “vault paradigm” – a place where files are located. PDM systems allowed to users to check-in/check-out data between vault and local workspaces (folders) to make changes. It was certainly pain relief for engineers. It made possible to check-out file and lock it for changes. But it created new problems too. Some of them were related to integration between data management CAD design functions. PDM tools are conflicted with CAD tools and engineers mostly hated PDM because of that. Cloud technology open a new opportunity in front of CAD and PDM developers. First time I talked about it almost 5 years ago. Navigate to my old blog post – The future of CAD without files. I can see a great synergy in the development of CAD and PDM tools. New cloud CAD tools are providing PDM functions natively integrated into design environment – CAD-PDM paradigm is changed. Data management is a first problem to be solved to develop cloud CAD. Read more here – Cloud CAD should solve PDM problems at first place. Without that, it is hard to leverage some of natural cloud advantages of being connected to the right data and collaborate between people. But not all cloud technologies are the same. Devil is in details. You can check my previous post for more details – Autodesk and Onshape disagree about cloud technology and focus. Another one – How Fusion360 and Onshape are solving fundamental collaboration problem. Another example came from Fusion360. It uses Autodesk A360 data management services to store assembly and parts files. 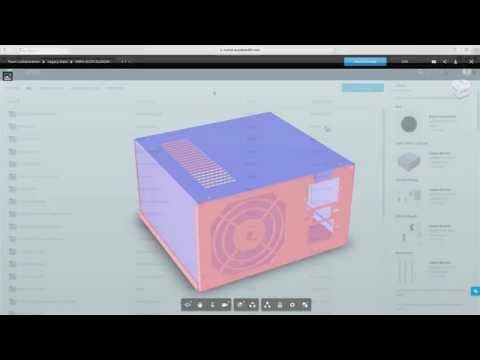 In the following video you can see Fusion360 and A360 demo. A360 is simplifying data management by eliminating the need to handle files and relationships. But at the same time, I still can see a notion of files. This is probably an implication of the fact A360 is a cloud platforms that can handle any time of data – Fusion360, AutoCAD, Revit, Inventor and others. I didn’t find an example of how two people can work in the same assembly or part and edit data simultaneously (If you are aware about this feature, please let me know).